In the United States, the fourth Thursday of November is designated as Thanksgiving Day. Its purpose originated in October 1621 when the Wampanoag Native Americans joined with Pilgrim settlers to celebrate the harvest time. Here is a link if you want more details. 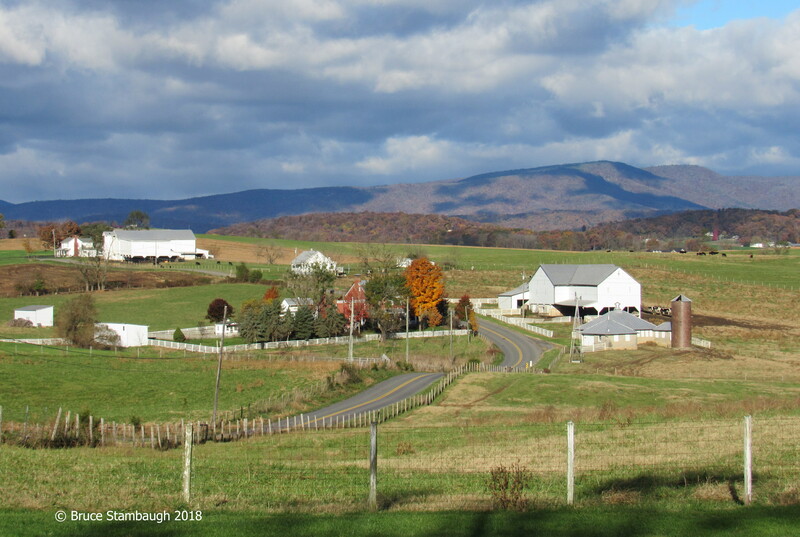 In honor of the day and the season, the Photo of the Week is a typical scene from Virginia’s beautiful Shenandoah Valley, where my wife and I have lived since May 2017. 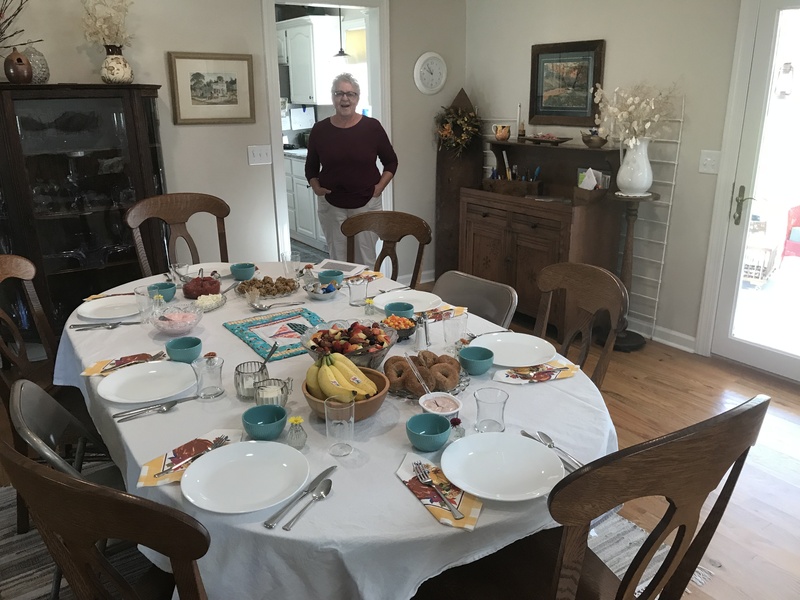 We will be having the traditional meal of turkey and all the trimmings, including the grandkids’ favorite dessert, Nana’s delicious apple pie. 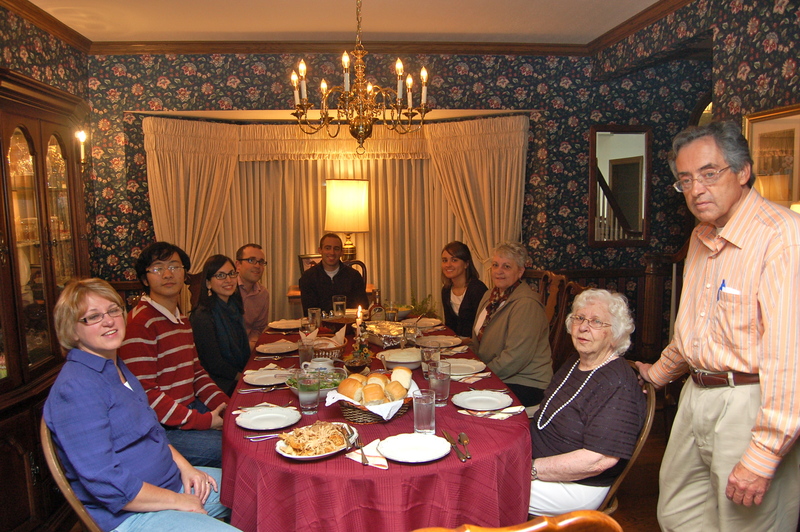 Wherever you may live, from our family to yours, Happy Thanksgiving! Springtime in Ohio’s Amish country. Spring! It’s a word that rolls off our tongues with joy and passion. I give thanks for this vibrant, vernal season, especially after the long, cold winter too many of us had to endure. This past winter surely tested our patience. But patient we must be. As much as we welcome springtime into our lives, she, too, can be fickle and bring mixed messages. Much like fall, springtime weather can embody all four seasons. Still, let’s give thanks for springtime. I realize that in our North American society, Thanksgiving is reserved for the fall. 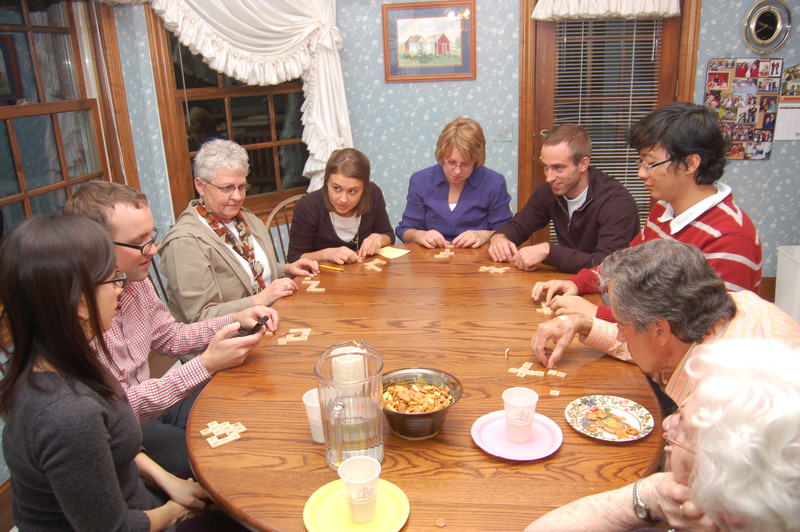 Canadians annually celebrate their Thanksgiving on the second Monday of October. U.S. citizens wait until the fourth Thursday in November. The Thanksgiving holidays acknowledge all that we have. The reflective focus is on the harvest, glad to have reaped the benefits of all the hard labor used to produce the yield. But we also need to be thankful for the spring. There are no apples without the blossoms and the pollinators. I’m grateful for springtime even though some years, like this year, she takes her good old time making her presence known. Still, I say, let’s all express our thanks for spring’s debut. Spring’s arrival creates a variety of reasons to rejoice often based on where you live and what activities ensue. Much action has an agricultural bent. Suburbanites will gas up their lawn mowers for the first of many rounds around the yard. City dwellers will pot tomatoes, peppers, and petunias to baby on their balconies. More ambitious gardeners with sufficient plots of land will plant their seeds and seedlings, always keeping a wary eye on any frosty forecast. 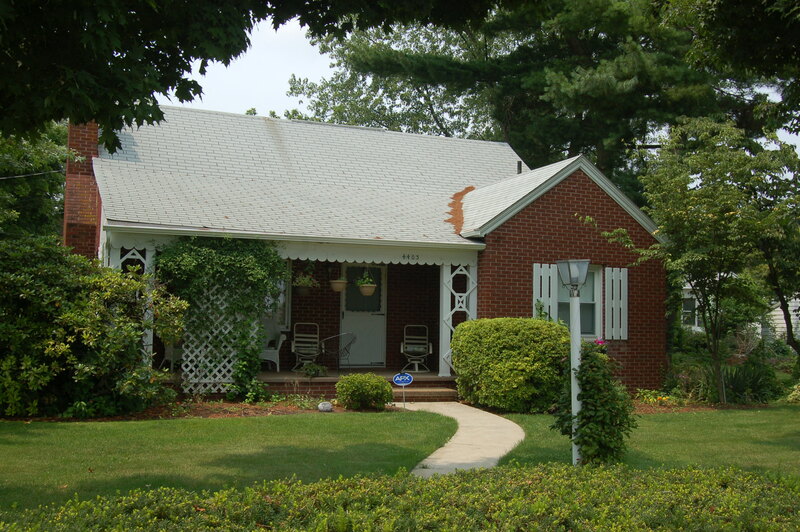 Flowerbeds will be mulched, windows washed, and if time allows, neighborly visits will resume right where they left off last fall. Songbirds fill the twilight with concertos. Dormant lawns, long browned from winter’s sting, green up from an overnight shower. Azaleas, daffodils, dogwoods, redbuds, and forsythia brighten the awakening landscape. Shouts of children riding bicycles or skateboards echo through neighborhoods regardless of setting. For all of this, I am thankful. Why not? It is the season of renewal, and after the winter that wouldn’t end we all need a breath of fresh air, we all need to inhale those sweet fragrances, we all need to enjoy each moment as the bees, birds, and butterflies reappear. No matter how long spring takes to settle in to fit our particular comfort level, we should be most thankful that the season of hope and renewal is upon us. In keeping with that regeneration, it’s good to express our thanks to others each and every opportunity we can. Share your joy with others the way a mother robin cares for its young. Spouse, plumber, daughter, son, grandkids, stranger, receptionist, parents, waitress, checkout person, or whomever you meet will do. Life is in a constant state of change. Spring is that reminder to us to embrace not just the new season, but life itself. 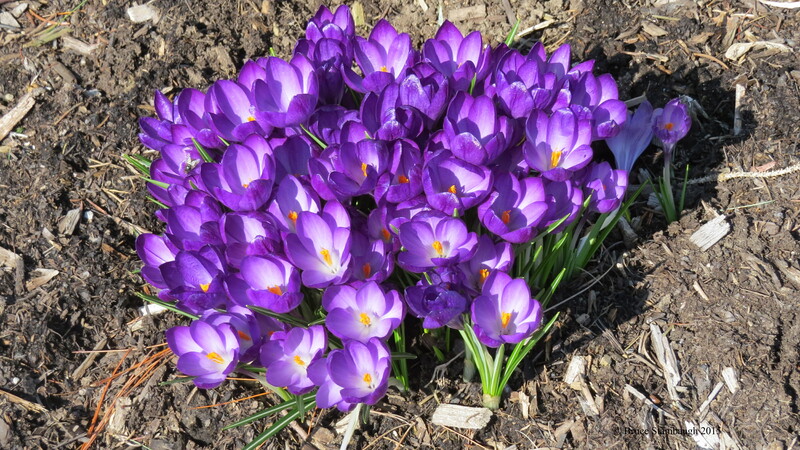 The message of the purple crocuses is to put away your fears. Spring is here. Life is good. Without the season of renewal, there can be no harvest. At this sacred time of year, let our thankfulness replicate our gratitude for life itself, the life we have lived, are living, and the experiences yet to come. I’m thankful for spring’s freshness, its vibrancy, virility, brightness, and renewed blessings. Life’s eternal cycle of renewal has returned once again. Let’s rejoice and be glad in it! I always have mixed emotions whenever November rolls around. Like you, I know what it means. After the excellent weather of October, I hate to think of what November might bring. I hope November doesn’t take offense. 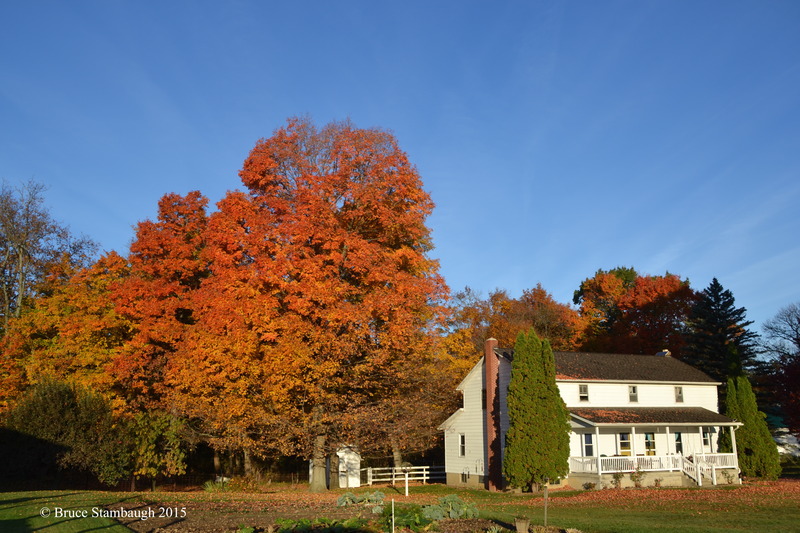 I so enjoyed the string of amazing days we had during the height of the leaf looking season here in Ohio’s Amish country. Given the traffic jams I encountered, I wasn’t alone. 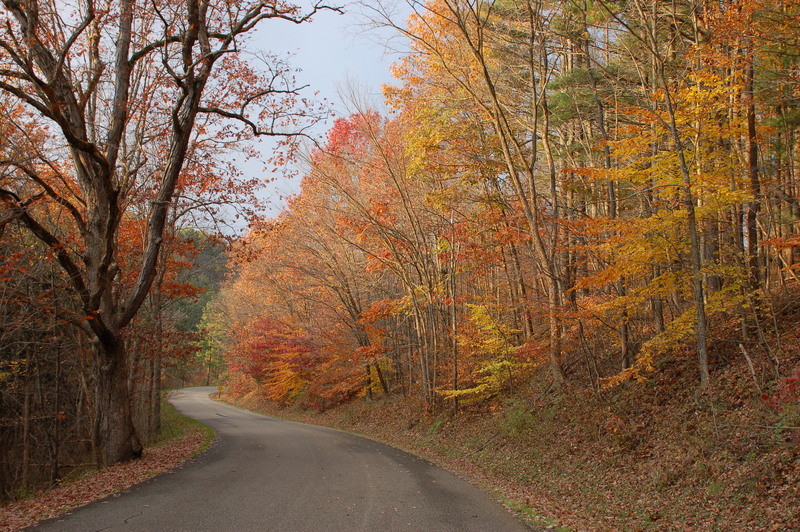 I cruised the back roads for calendar-worthy snapshots of the naturally painted landscapes. With the predominance of rolling hills and gentle dales, a Currier and Ives setting arose around nearly every corner. In some spots, I merely rotated to take multiple scenic photos. The truth is I only had to step out my front door for a lovely sunrise photo. In the evening, it was the reverse. 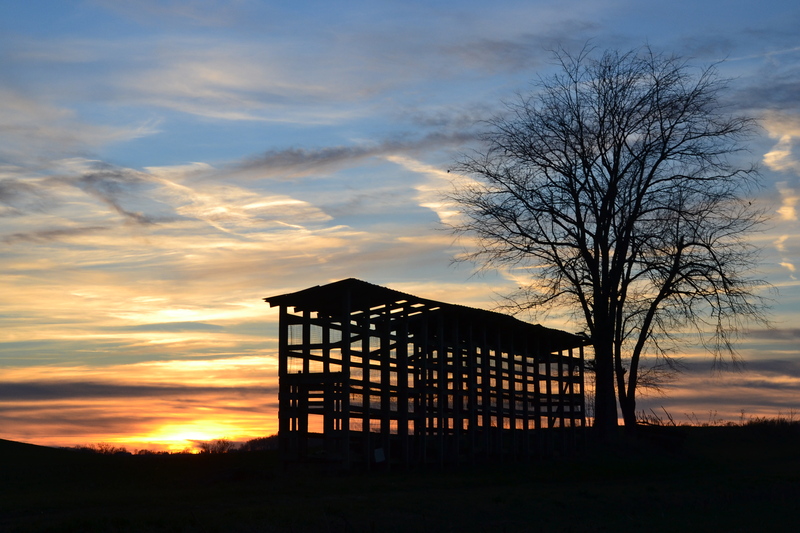 I have four seasons of brilliant sunset shots behind my Amish neighbor’s farmstead. Once the leaves began to color this year, red, yellow, orange, gold and crimson rainbows basked in the sun for all to absorb. Stunning doesn’t begin to describe the landscapes. Those inspiring scenes changed much too quickly for my liking, though. The colorful leaves have mostly fallen, and the dormant season is upon us. Welcome to November. The Canada Geese fly from farm pond to harvested grain field where they glean to their gullets’ delight or some hungry hunter scares the flock to flying and honking with blasts of his 12-gauge. Given their numbers, I think the geese always win that war. While the geese stick around, other waterfowl species wing it south. Pintails and Sandhill Cranes often lead the way. It’s a ritual that makes me smile and sad simultaneously. They’re a joy to watch, but it’s a sure sign of what weather is ahead. I marvel at the majestic flights of all species avian. To have a Pine Siskin make a brief pit stop at your feeder brings momentary elation. On the other hand, finding the first White-crowned Sparrow of the season checking the same feeder tells me I’d better get ready for another winter. Perhaps that is November’s ultimate purpose. 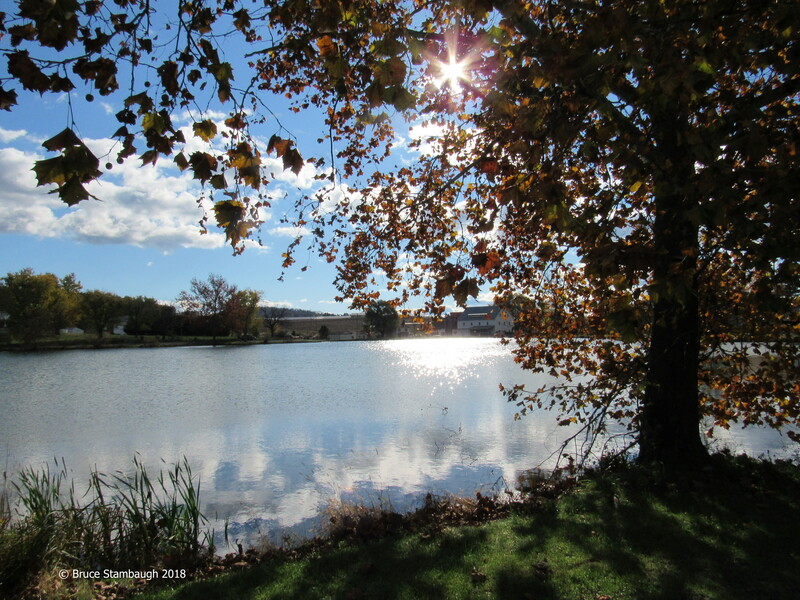 November’s fickle weather pattern is familiar by now. Its early days seem more like an October extension. A few deciduous holdouts flash the last of the lushest leaves before they drop overnight leaving only the burnished oaks to rustle in the wind. By the month’s end, the world can suddenly change with the passing of one strong cold front. The silvery down of the milkweed seeds sail through graying skies only to be replaced the next day by the season’s first snowfall. We’ve returned to standard time, accentuating November’s shorter days. It’s nature’s way of prepping us for colder, darker days to come. In North America, we have concocted a dodgy purpose for the eleventh month. November ushers in the holiday season here in the United States. Commercially translated, it’s time to shop as if you needed a reminder. Near month’s end, Thanksgiving rings in the festive mode and the glitzy commercials. Christmas then isn’t far behind. October’s golden days are gone. 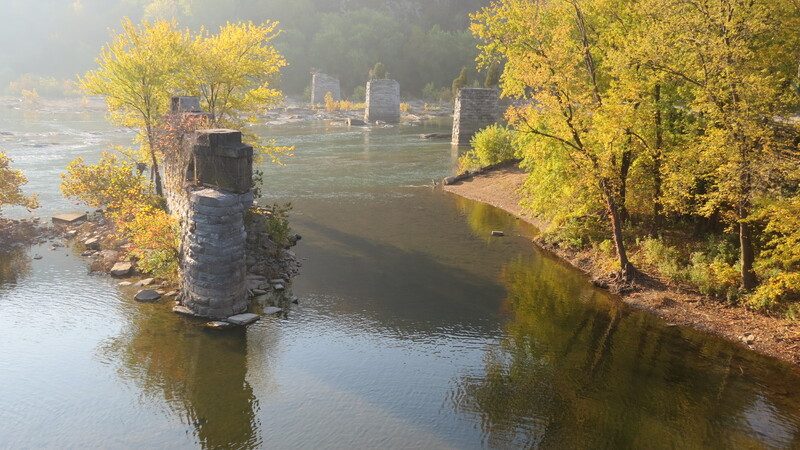 The best we can hope for now is a late Indian summer. We’ll take it even if only lasts a day or two. Ohio’s pleasant weather has melted away like a stick of butter on a hot griddle. It’s time to stack the firewood, put in the storm doors and enjoy a warm cup of mulled cider. We have to face the truth. November is upon us. November snows in Ohio are not uncommon. The five of us men sat around the breakfast table enjoying the tasty food and each other’s company. As much as I cherished knowing these friends, and the nutritious breakfast, it was the conversation that captured my attention. Half way through the hour-long gathering, I realized I was smiling, grateful to be included in this forthright discussion about what really matters in life. The hard, direct questions about life and death enthralled me. The frank, honest, heartfelt answers fueled the no-frills banter. November sunset. © Bruce Stambaugh 2014. This was a Thursday morning, the usual bi-weekly get-together of our cancer support group, affectionately known as the Bluemen. Blue is the color for prostate cancer, and that was a common denominator of the group, save for one member. Our host, normally a reserved, contemplative man, was passionately engaged in the meaningful discussion. By early Monday morning, he had died. When I learned of his death, I wasn’t shocked. Deeply saddened yes, but not surprised given that intense interaction I had witnessed regarding life and preparing to die. That precious morning, I sat and listened mostly, participating only when absolutely necessary. I was too absorbed to interrupt the flow of the dialogue’s stream. Our friend, Bill, had joined our cancer support group for just that kind of interaction. This diminutive but gentile giant of a man wanted our companionship in his journey with prostate cancer. We gladly welcomed him. 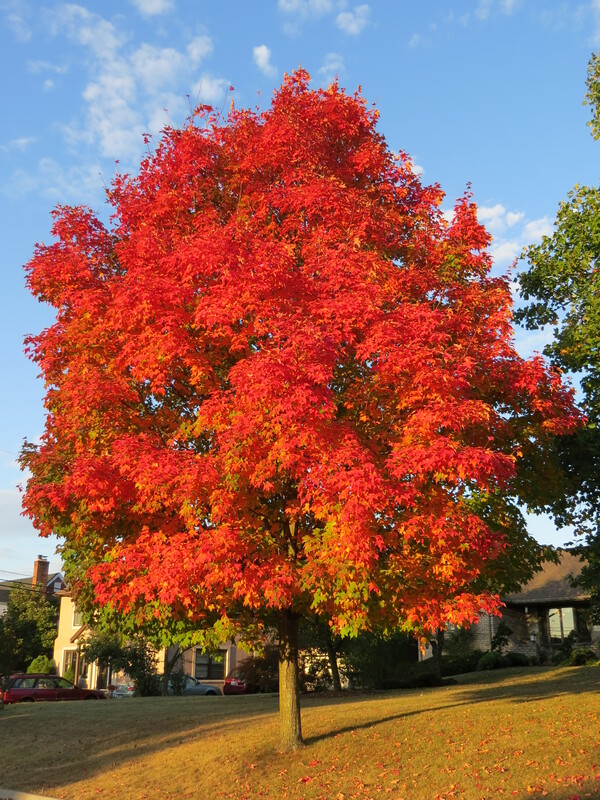 Red tree. © Bruce Stambaugh 2014. Bill immediately felt at home with us. One of the most humble individuals I had ever met, Bill easily joined in the group’s chitchat. He, like the rest of us, shared intimate details that only those with prostate cancer unashamedly reveal, even over breakfast. At times, this quiet, simple man talked our ears off. Once he even tried to introduce politics, a violation of our unwritten protocol. We all laughed. Though not a prostate cancer victim, Kurt joined our group because there are no living members to offer comfort for his kind of cancer. Just like Bill, Kurt held nothing back either. Our table talk revolved around what it’s like to die, are we afraid to die, what will we miss, what will we look forward to in the afterlife? And so it went, at first monthly, then every other week when Bill had a set back a few months ago. 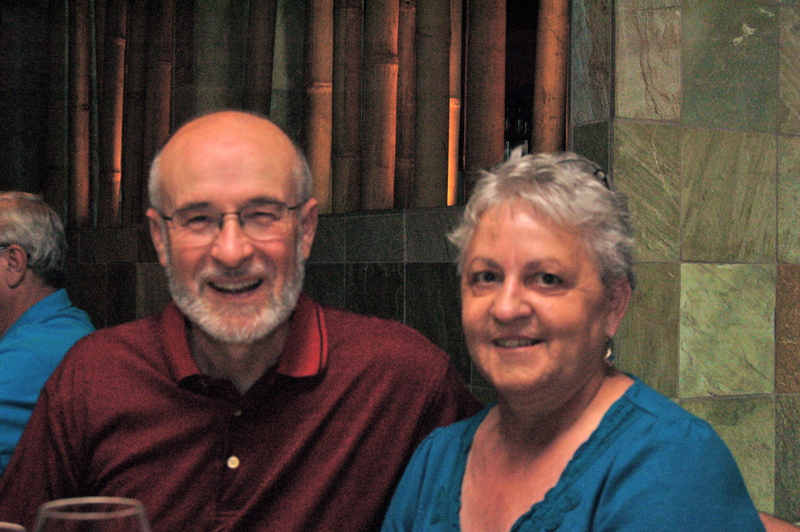 Bill wanted to continue to meet, so this affable man and his amazing wife invited us into their home. We ate, talked, and laughed some more. Sometimes we even shed a few tears. 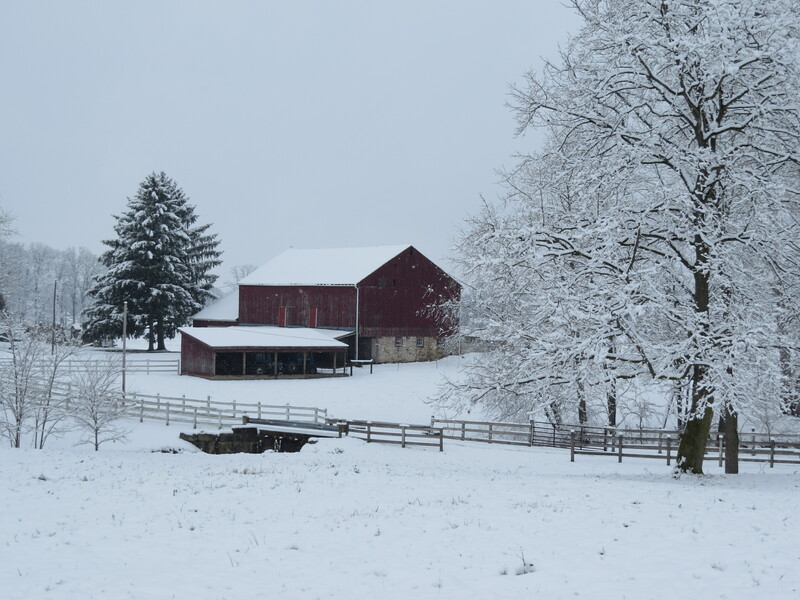 Barn in snow. © Bruce Stambaugh 2014. 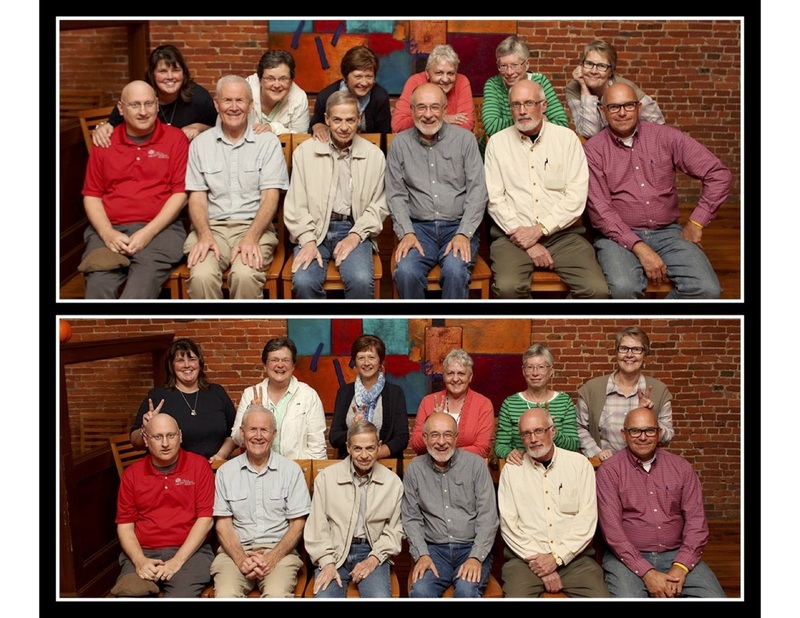 Besides cancer, the group members were bound as one by two other mutual traits. Our common faith, and our gratitude for the life opportunities we had had, and would have made us brothers. We had no idea of what was about to play out with Bill following that marvelous Thursday morning gathering. I was glad for the multitude of thanks expressed then for all that had come our way in life. The good far outweighed the bad, even including cancer. 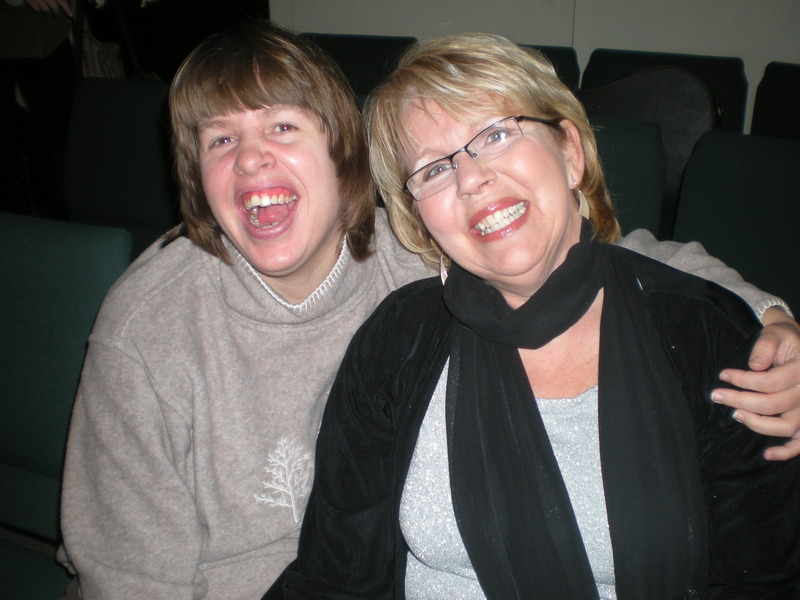 Each in our close-knit group was appreciative of life, to live, to love, to be loved. That was enough, more than any of us could ever have desired. The turkey and all the trimmings of Thanksgiving are nice. Our group’s regular sharing affirmed that being grateful means so much more than a holiday spread. 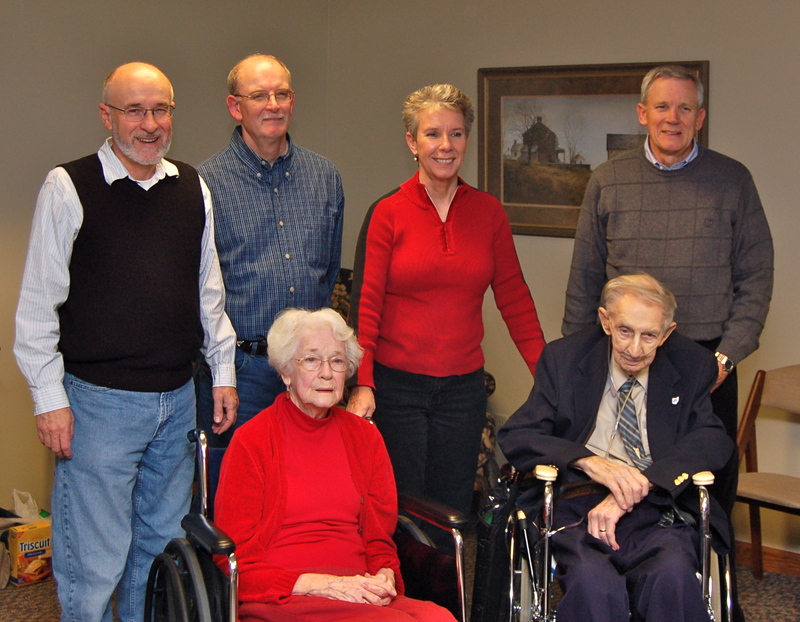 The Bluemen were most thankful for the immeasurable joy, love and fellowship of devoted families and friends. Isn’t that what Thanksgiving is really all about? 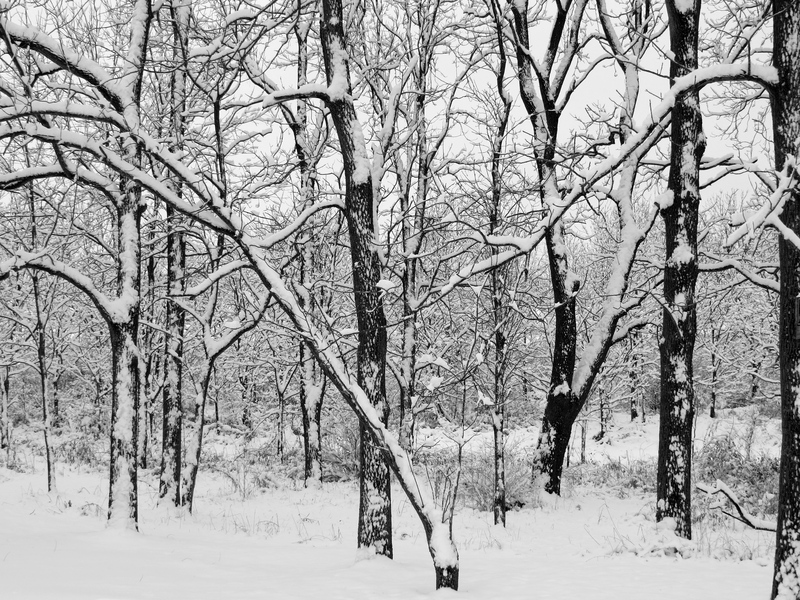 Snowy woods. © Bruce Stambaaugh 2014. During harvest, the Amish literally pitch in to help one another. Once the floodwaters of the historic July 1969 flood had receded, the residents of Killbuck, Ohio were in shock. Homes and businesses were either destroyed or severely damaged by the record high water levels. Townspeople were ready to give up, the cleanup looked so daunting. Then something amazing and unexpected happened. Scores of Amish and Mennonites arrived from the eastern section of the county, home to the world’s largest Amish population, to help. No one had asked them to come. They just showed up. The volunteers waded in and did the absolute hardest, dirtiest jobs, clearing out mud and muck with no complaints. They did it all out of a basic foundation of thankfulness. Helping in times of need affords the Amish a method of connecting with the community. It is their personal and active way of expressing their appreciation for community and country, and the cherished ability to worship freely. 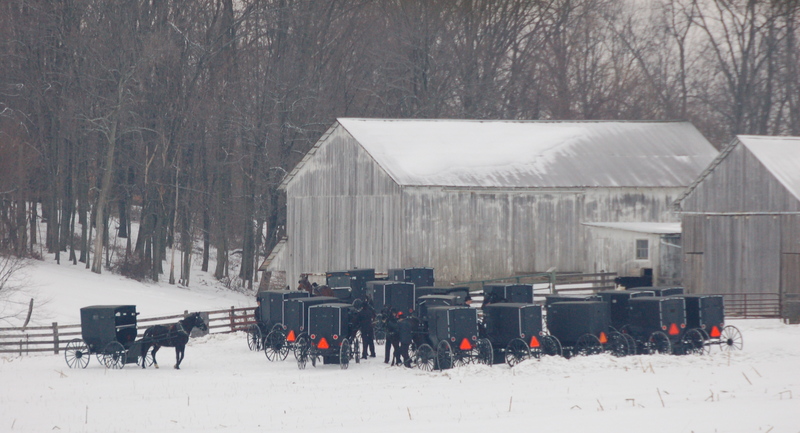 Gathering the buggies before church at an Amish home in Holmes Co., Ohio. Amish do not normally participate in organized governmental positions. They do not take oaths, which such positions often require. Consequently, when opportunities to assist others arise, the Amish respond. The Amish do not always wait for disaster to strike either. They are proactive in helping the less fortunate. Donating blood is one of those opportunities. It’s not unusual for a local blood drive to collect 100 or more units every 56 days. 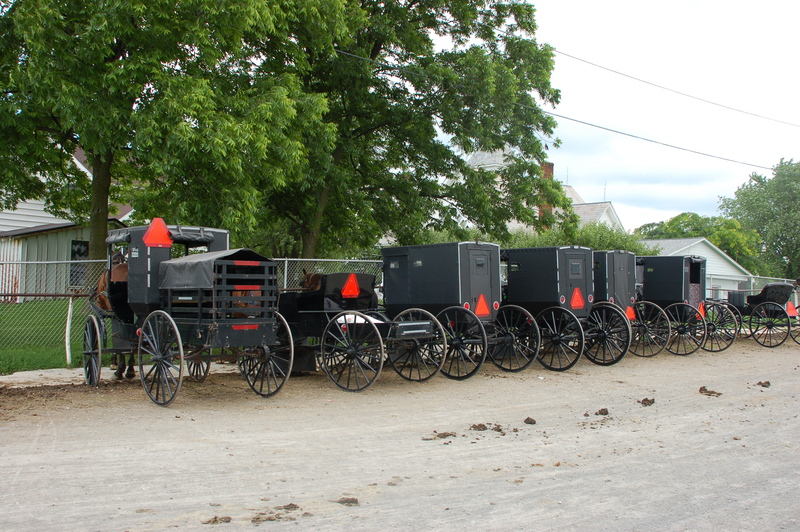 The Amish also show their thankfulness by helping with numerous annual benefit auctions that are held locally. A short list would include The Rainbow of Hope auction, The Ohio Mennonite Relief Sale, the Holmes County Home and the Holmes County Training Center. The hitching rail at the Mt. Hope, Ohio, Auction is lined with horses and buggies on sale day. Supporting such causes is borne of a two-fold purpose for the Amish. They recognize the importance to help those who have particular needs, and they also accept that they could possibly be in that situation themselves. They are grateful for whatever happens. To briefly identify the purpose of the aforementioned benefits helps to understand the depth and breadth of the Amish aid. 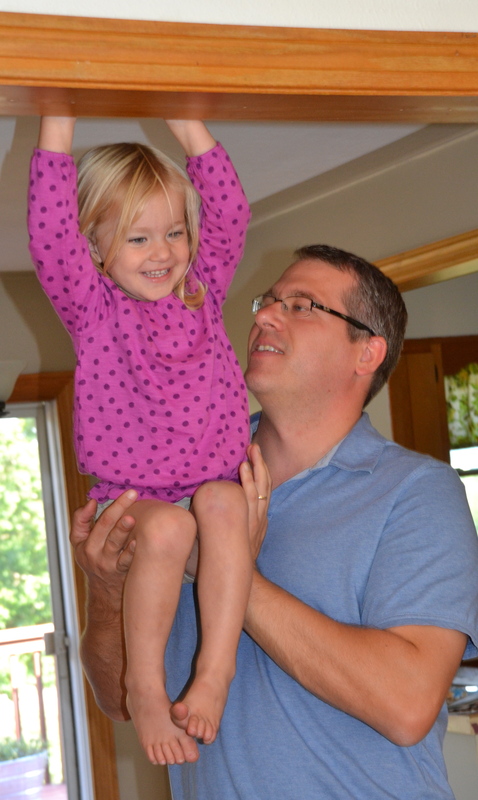 Funds from the Rainbow of Hope auction assist children with major medical bills. The Relief Sale raises funds for worldwide projects under the direction of Mennonite Central Committee. 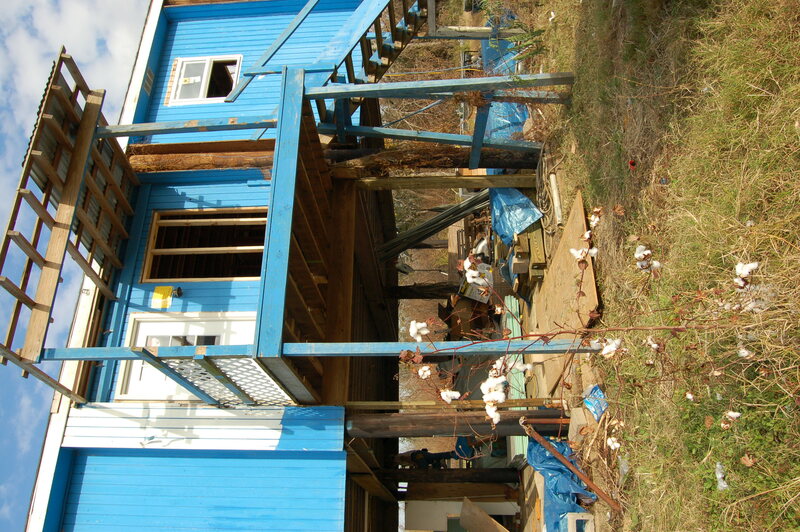 A home damaged by Hurrican Katrina in Boothville, LA was repaired under the direction of Mennonite Disaster Service. 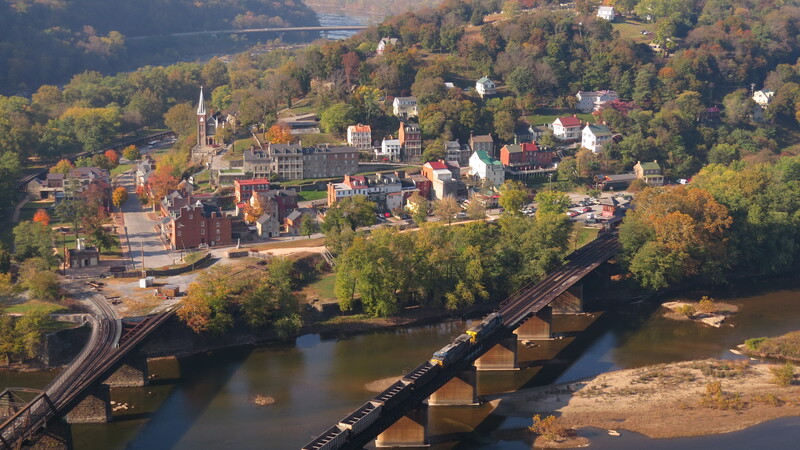 Amish even travel far from their geographic area to put their faith into action. After Hurricanes Katrina and Rita, scores of Amish assisted in the Gulf States cleanup and reconstruction. So many helped, in fact, that Mennonite Disaster Service set up an Amish only camp where the volunteers could live according to their normal lives without the influence of distractions like television and the Internet. Locally, the auctions for the county home and the Training Center raise operating funds. 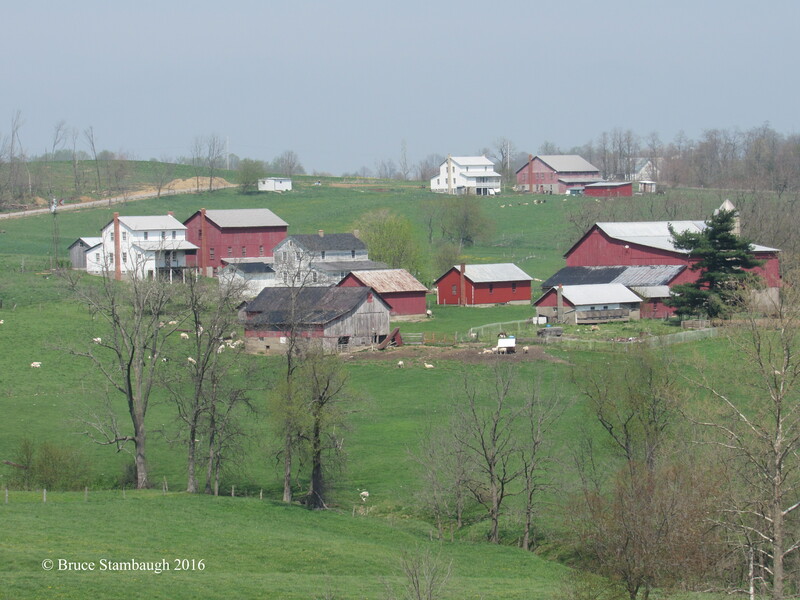 The county home has some Amish residents, and Amish make up a good percentage of the population at the Training Center, which works with developmentally challenged students and adults. Another way of contributing to the common good for some Amish is to join the local volunteer fire department. Several area departments have Amish on their rosters as firefighters and emergency medical technicians. True to their desire for modesty, the Amish want no recognition or publicity for their kind efforts. Their satisfaction comes from the simple act and ability to help others. 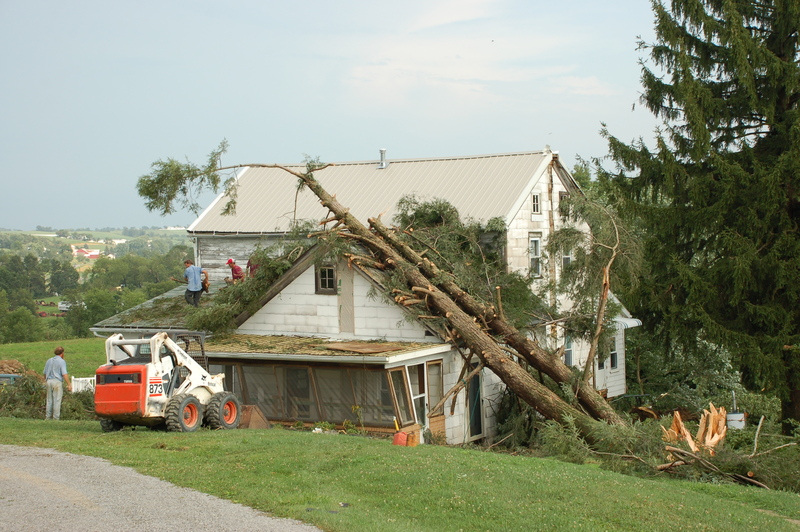 Amish quickly helped their neighbors have a severe thunderstorm hit near Charm, Ohio in July. Of course, the iconic images of Amish helping at a barn raising are conjured up as the ideal way to help their neighbor. But their generous participation in the community and world at large clearly shows that the Amish think and act out of thankfulness far beyond their own immediate area. To be sure, most Amish families embrace Thanksgiving as a day of joyous celebration of community, bountifulness and life itself. 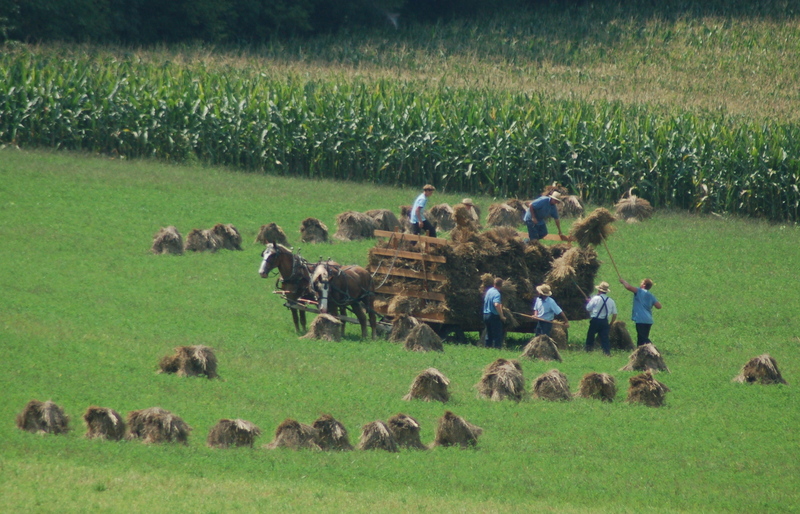 Even then many Amish approach the day piously, fasting in the morning prior to the feast that includes all the traditional trimmings. 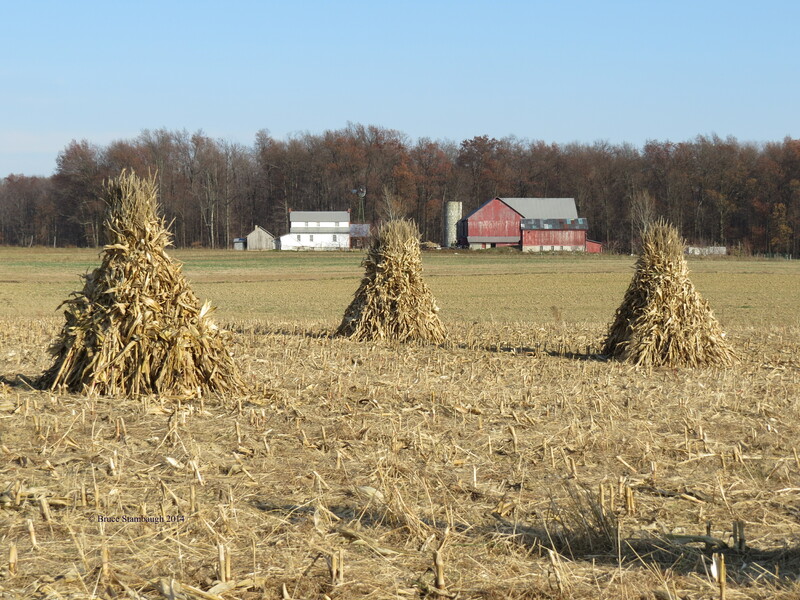 The Amish mark Thanksgiving Day as a pinnacle to a lifestyle of serving. Fittingly, they would be too modest to acknowledge that fact. 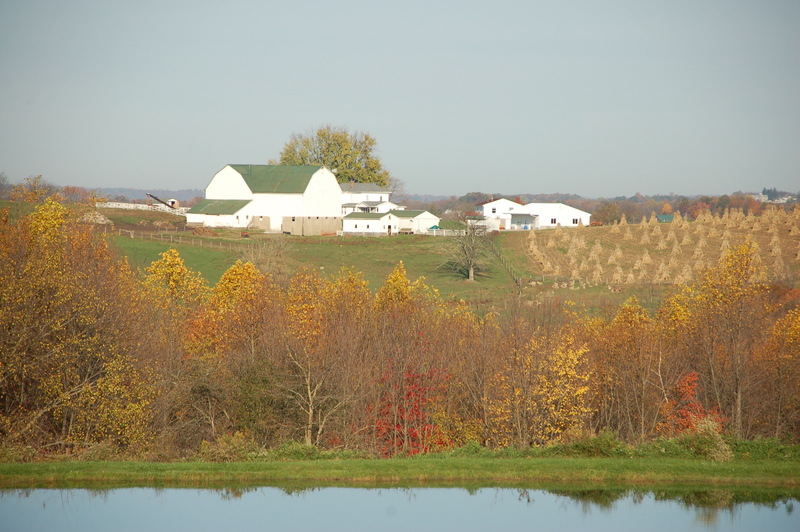 A typical Amish farm in the fall in Holmes County, Ohio. This article appears in the November 2011 edition of Ohio’s Amish Country magazine. The school superintendent called him his million-dollar man. To illustrate his point, the school leader even had mock million dollar bills printed with the person’s face front and center. The scenario played out at the beginning of this school year in the school district where I had grown up. Along with hundreds of others, I had been invited to attend the opening rally as a guest. As people entered the stadium where the ceremonies were held, each person was handed the play money. During the 90-minute ceremony, the superintendent recognized many people in the district for their outstanding efforts. He also announced that the district had achieved the top academic awards in the state. The summit, however, was this one man who had worked so tirelessly to reduce costs for the financially strapped district. 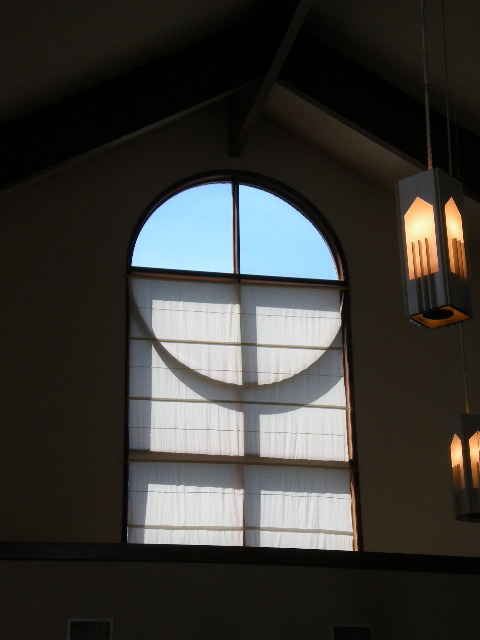 The superintendent had calculated that this one individual had saved the district a million dollars through cost saving changes, including the installation of energy saving light bulbs. That’s what earned him the extra special notoriety. I was duly impressed and honored to have witnessed this celebrative opening to another school year. 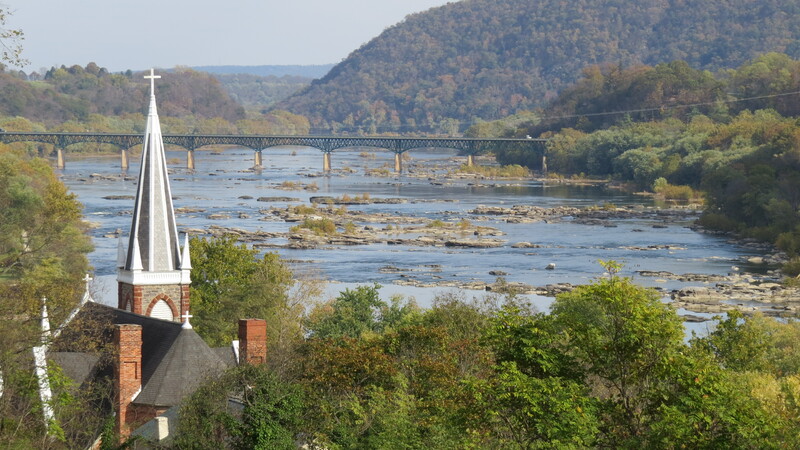 Though I had not been a part of the district for years, I felt connected and inspired by what had transpired. The proceedings were a reminder to me to thank those who have made a difference in my life. Of course, I realized I wouldn’t have to have play money printed up to do so. A simple word of thanks, a personalized note card, a hardy hug, would send the proper and immediate message. Believe me, I have much for which to be thankful this year. This hasn’t exactly been the healthiest year of my life, and yet, here I am at Thanksgiving, alive and well, and forever grateful. A good place to start would be with my wife, who has been by my side through thick and thin. She has gone far beyond the second mile for me. I have nothing but praise for the good doctor who removed the cancer from my body. My recovery continues. Overall, I feel great, and best of all I am cancer free. At the same time, I can tick off person after person that I either know personally or have heard of who have not had the same results. Their illnesses or injuries remind me to be humble in my elation yet determined in my prayers for them and their families. Still, as the thoughtful and expressive superintendent modeled, we must not hold back in our praise of others when they accomplish great things for themselves or for the good of the community. It truly is better to give than receive. As we approach this national holiday of thanks with its abundance of savory food and gathered family, I plan on thanking people who have made a difference in my life. I’ll tell them how much they have meant to me and how appreciative I am for their contribution to my life. How about you? Who have been the million dollar people in your lives? As part of celebrating this Thanksgiving, consider offering a few words of thanks to those who have helped you along your life’s path. You don’t have to print up hundreds of fake million dollar bills to show your appreciation. But you can if you want.